LSU Computational Solid Mechanics Laboratory – The CSM Lab promotes research in materials science at LSU and with other research teams around the world. Welcome to the Computational Solid Mechanics Laboratory at Louisiana State University! The Computational Solid Mechanics (CSM) Lab promotes research in materials science at LSU and in conjunction with other research facilities and teams around the world. By specializing in numerical analysis and experimentation at the nanoscale, CSM pioneers the advancement of knowledge in this emerging area of science. Engineers, scientists, and technicians design new products for many reasons: to increase productivity and efficiency in the industrial process, to reduce the cost of manufacturing, to replace existing products that are aging, and to add new features that will benefit people’s lives. Throughout the design process, selection and preparation of proper materials is crucial to achieving the desired result. As researchers understand more of how and why materials behave under real-world conditions, they can use that knowledge to create materials that are stronger, lighter, tougher, safer, etc. than those that are commercially available today. Building on the discoveries of past research efforts, this laboratory uses information from experiments with materials in conjunction with a powerful supercomputer to properly characterize material behaviors such as: Axial and torsional deformation, Elasticity and plasticity, Wear, Creep, Hardening, Perforation, Buckling, Fracturing, Shear bands. We work to relate these natural phenomena to conditions such as: Tensile loading, Indentation, Micro-torsion, Punching, High impact loads, Moving loads. The term “degree of doctor honoris causa” originates from Latin and means “doctor of merit” translating literally to “doctor for the sake of honor.” In academic tradition, the degree of doctor honoris causa is the highest dignity and the greatest honor that can be conferred by a university on persons who particularly contributed to science and the university. Recently, LSU Civil and Environmental Engineering Chair George Z. Voyiadjis received this honor from Poznan University of Technology in Poznan, Polan. Professor Tomasz Lodygowski, Rector of Poznan University of Technology has this to say about the conferred honor. Reston, Va. – George Z. Voyiadjis, D.Eng. 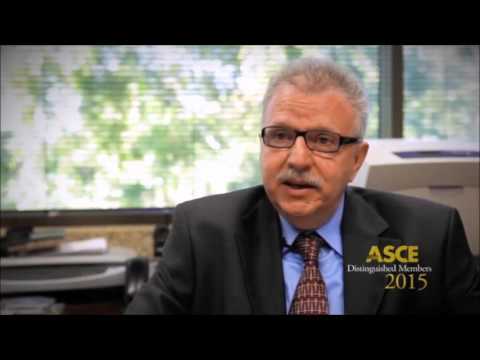 SC., F.EMI, Dist.M.ASCE was recently named a Distinguished Member of the American Society of Civil Engineers (ASCE). The society’s highest accolade, to date only 649 of ASCE’s worldwide members have been elected to receive this honor since the society’s founding in 1852. Voyiadjis was recognized for his contributions to multi-scale modeling of materials to address problems in high energy impact, damage of structures and instabilities, and for developing a sustained research effort in predicting the behavior of materials in structures. He received the award at the ASCE Annual Convention in New York, N.Y., Oct. 11-14, 2015. Some of his notable contributions include leading a joint effort from 1986-1989 on the analysis of the rupture of the Space Shuttle Challenger’s fuel tank. He proposed and developed numerical models and simulations of structures considering damage evolution and helped other researchers and industries achieve a better understanding of a structure’s behavior. He is currently a Boyd professor, one of the highest distinctions at Louisiana State University for exceptional scholarship, service, and dedication to the field, university and students. In addition to 41 years of teaching, Voyiadjis has written books including Advances in Damage Mechanics: Metals and Metal Matrix Composites with an introduction to Fabric Tensors. In addition to his project contributions, Voyiadjis has impacted the discipline through developing constitutive models for various materials and structures. He also holds two patents on fenders for pier and bridge protection against vessel collision. His achievements have earned him honors including ASCE’s 2008 Nathan M. Newmark Medal. Voyiadjis holds a bachelor’s degree in civil engineering from Ain Shams University in Cairo, Egypt, a master’s in science from the California Institute of Technology and Doctor of Engineering Science degree (D.Eng.Sc.) from Columbia University.